COIT awards Sara Rodriguez-Lopez (BIT) with the "Best Master Thesis of Spain 2013"
Sara Rodríguez-López was born in Madrid, Spain, on December 17th, 1989. In 2007 she began her studies in Telecommunication Engineering at the Escuela Técnica Superior de Ingenieros de Telecomunicación (ETSIT-UPM). From September 2012 she has been working in Biomedical Image Technologies (BIT), a research group recognized by Universidad Politécnica de Madrid (Technical University of Madrid) . During her research at BIT, Sara has taken part in Team CT, one of the research groups created within M+Vision consortium and whose leader is Germán González Serrano (Massachusets Institute of Technology M+Vision Fellow). This project has been undertaken in collaboration with researchers from the Brigham's Women Hospital (Frank Rybicky and Raul San José Estepar), Biomedical Imaging Technologies from Universidad Politécnica de Madrid (Sara Rodriguez-Lopez, Daniel Jimenez-Carrertero and María Jesús Ledesma-Carbayo) and Unidad Central de Radiodiagnóstico (Eduardo Fraile). 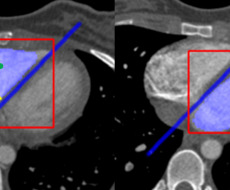 She has collaborated in the development of a completely automated algorithm to compute the right-to-left ventricular (RV/LV) diameter ratio from Computed Tomography Pulmonary Angiogram (CTPA) images. This tool can be used to evaluate the risk of death of patient suffering from pulmonary embolism based on the right-side heart enlargement that the illness caused. Sara's contributions to this project resulted in her Master Thesis: “Development of Algorithms for Automatic Detection and Segmentation of the Heart in Computerized Tomography Images”, whose advisor was Daniel Jiménez-Carretero, also a collaborator of Team CT research. She defended her Master Thesis on July 2013 and achieved the higher rate with Honors. Every year the Spanish Professional Organization of Telecommunication Engineers (Colegio Oficial de Ingenieros de Telecomunicación – COIT) rewards the excellence of the best Master Thesis and the best PhD Thesis performed by Telecommunications Engineers in Spain. As of June 2014 Sara has received the prize to the best Master Thesis in the Engineering and Medicine category awarded by that institution.